Antarctic sea ice extent at the end of July was the highest on record for that day, growing to 18.077 million sq km. The previous record of 17.783 was set in 2010, whilst the 1981-2010 average was 16.869. Ice extent has been above average all year, and, according to NSIDC, is outside the 2 Standard Deviation range now. Sea ice area also continues to run at well above average. Good post Paul. Perhaps you can convince Anthony to repost on WUWT? For the record, I predicted this year’s extent would smash previous records several months ago; based on a large jump in the size of the summer minimum extent…an educated SWAG. Perhaps Anthony is being overly-cautious, but the probability of closing out the season at a record high is better than 90 percent, based on previous patterns of growth for the remaining Antarctic Winter. I’ll suggest he puts it in the hot sheet tomorrow. Can the effect of the albedo of the Antarctic ice sheet be that strong? Below the Antarctic Circle, Doesn’t Solar radiation strike the ground at such an acute angle anyway, and for only a varying percentage of the year? Wouldn’t that minimize the effects of that growth? I would attach more weight to the presence and longevity of more southern snow covers, say, in Siberia and Central Asia. Is that growth reflected in a corresponding thickening of the continental ice sheet as well? If so, then shouldn’t that counter the effects on seal level of the melting of the Greenland ice sheet? I, for one, believe that the presence of ice on this planet is akin to hair on a male. If one has ever observed an older, balding man strolling shirtless with his son on the beach, one begins to realize that it’s not the presence or absence of hair that’s the issue, it’s the faulty distribution of it. So it appears to be with sea ice. Certainly the Siberian snow covers are more important. It is worth noting though that the Antarctic sea ice is more extensive, and tends to be further from the pole than the Arctic. Therefore it has more of an albedo effect than the Arctic. Any ideas why there is more sea ice in the Antarctic? The recent temp anomalies have been over +4 C.
Surface temperature figures are highly unreliable as there are so few stations. Satellites show that atmospheric temperatures down there are running well below normal this year around most of the continent. There are numerous studies looking into the increase in antarctic sea ice, notwithstanding questions about temperatures these include the impacts of continental (i. e. fresh water ) ice melt reducing salinity and the impacts of the ozone hole. Furthermore, the extent of sea and land ice levels across the continent have been markedly different, with for example; major ice losses on the antarctic peninsular according to the British Antarctic Survey. Global sea ice area is bang on the mean at the moment. Salinity is a complex area. For instance, salt is expelled as the ocean water freezes to form sea ice. This creates dense brine that sinks and flows down the continental shelf of Antarctica to form Antarctic Bottom Water – the densest water in the open ocean. But that’s the troposphere temperature, not the surface temperature. How can you be sure that it reflects what’s going on at the surface? True. But the land stations give no better idea of what the sea temperatures are doing, which is where the sea ice is forming. But maybe the ice is growing because it is getting warmer. And maybe the Arctic ice has declined in recent years because it is getting colder! BTW, just checked the RSS analysis based on the UAH data and discovered blank patches around the poles. http://www.ssmi.com/msu/msu_data_monthly.html Further investigation revealed that the satellite data does not cover the poles, which makes sense when you consider the orbit So what’s the deal with your link? How do they calculate the temperature at the poles? RSS go to 70S, UAH to 85S. Still much more coverage than any surface stations can give. But your link of the satellite data showed temperatures at the poles: how did they work it out? Maybe they interpolated it too? BTW don’t forget that they show tropospheric temperature not surface temperature in any case. The sea ice is forming out at around 60S. The temperature at the pole is irrelevant. And land temperatures are not sea temperatures either. Now we’re getting somewhere: the number of surface stations around 60°S is not trivial. You can see here that the warming there is about +0.5°C. 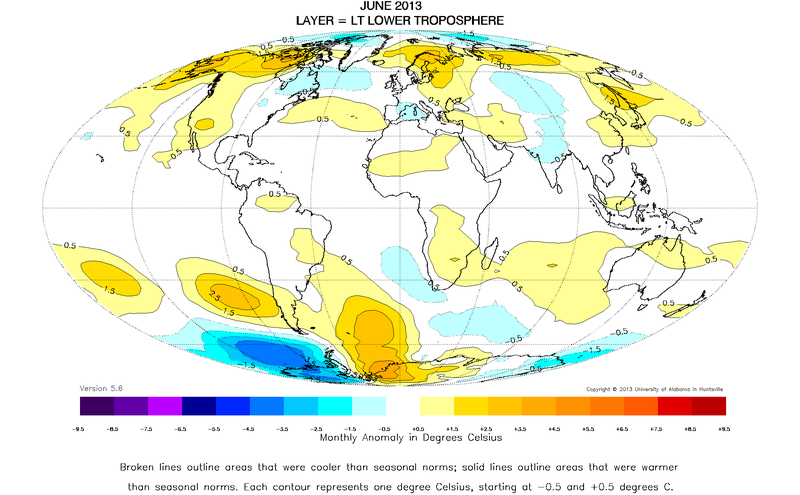 And your June satellite data doesn’t show on average any large anomaly. So if the temperature anomaly is insignificant, what else could lead to more sea ice being formed? Land temperatures don’t tend to affect sea temperatures, it is the other way round. Factors involved in sea ice extent are many and complex. E.g. sea temperatures, ocean currents, wind patterns and strength, atmospheric conditions, cloudiness, ENSO conditions. It is worth noting though that, according to GISS, the annual temp for 64S to 90S was the lowest since 2004. “Land temperatures don’t tend to affect sea temperatures, it is the other way round.” Nope: it depends on the albedo. There’s a lot more sea than land, so it’s easy for a large proportion of incoming heat to be hidden in the depths to be released. But you’re right that many factors affect sea ice build up, but you missed out one of the most important ones for the Antarctic: salinity. And what is the significance of your, unlinked, claim about the temperature being the lowest since 2004? In fact, what was the point that you were trying to make with this post? So what are the salinity measurents? BTW – GISS don’t extrapolate land temps over oceans, for the simple that they have very little correlation. Actually what is significant about “It is worth noting though that, according to GISS, the annual temp for 64S to 90S was the lowest since 2004.” is that you’re refering to one of those surface temperature indexes that you think is unreliable. But you obviously think it is. It’s been waiting 26 years for someone to dispove it, but no one has, so what do you base your claim on? If Hansen was right, we would not bother with thousands of temperature stations round the world. We would chuck out all the dubious urban, airport and poor quality sites and concentrate on the small number of high quality sites. In any event, Hansen was talking of sites around the world not specifically Antarctica, and used trends from 1880. There were no sites in Antarctica then. Hansen was right or at least hasn’t been disproven in the last 26 years.. Your claim that we wouldn’t bother with all the other sites is non-logical. The more data the better and it also is useful for weather forecasting. The second sentence in the abstract of Hansen’s paper specifically says that at high latitudes the correlation is strong. The high latitudes are where there are fewest stations. That’s why there is less correlation at lower latitudes. But land temperatures are in any event irrelevant to sea temperatures, where the sea ice is growing. Thank you for confirming my point. More data is more reliable. No: there is probably less correlation in the lower latitudes because the air is less well mixed. The number of stations cannot influence the weather or climate. Of course land temperatures are relevant: there is transfer of heat between them. Hansen’s paper shows that continuous coverage in some areas of the Anarctic started back in 1945 with complete coverage from 1957. GISS have one station at the South Pole – Amundsen-Scott. The next station is 800km away. Not in the Antarctic. BTW did you actually read the Skeptical Science link? Humm not so sure about my previous comment about the satellites’ orbits: apparently some are in polar orbit. Hold that: according to Wiki the UAH satellite does not cover above 85°, which fits in with the RSS plot which uses the same data; http://en.wikipedia.org/wiki/UAH_satellite_temperature_dataset. Antarctica, Greenland and the narrow spine of the Andes. Funny how you never hear this on the news or in the funny papaers. Ian Plimer, in his book Heaven & Earth, publishers Connor Court, 2009 p49 suggests that there is a a reverse effect, when the arctic is warm the antarctic chills. Has anyone considered that? In Plimer suggests a lot in that book, but that doesn’t make it true, was there a reference to any peer reviewed science to back his claim up? Plimer quotes Blunier & Brook, “timing of millennial scale climate changes in Antarctica and Greenland during the last glacial period” on p146. Thanks for the reference Alfred W. Blunier and Brook from what I have read, make the link between antarctic warming preceding arctic warming by 1500 to 3000 yrs. millennial scale cause and effects cannot be conflated with simultaneous incidents occurring at the poles now. By the way they do it by using proxy measurements of methane I am surprised Plimer went anywhere near proxy measurements – given his view on the hockey stick. Ah, but is all this new ice floating in the water because its fallen off the Ice-cap via faster flowing glaciers? Anyone got any evidence?? The price of beef goes down as the drought starts – clearly its easier to raise beef cattle in a barren dust-bowl. And retreats when it is warmer. And don’t forget this is winter down there. I don’t think glaciers will be melting at this time of year. 1) Is that the only possible reason for sea ice increase? 2) has it been shown that the same drop in temps is the reason for today’s changes ? 4)You cannot draw a direct causal link based on what happened 200 years ago. 5)Why was it colder then? 6) Can you apply the same causal factors to sea ice changes today? The nonsensical reduced sea ice meme is emblematic of scant evidence supporting AGW. Reliable records extend for a period of 35 years; yet, somehow we are to believe that 1979 is a reliable baseline for measuring human induced warming…the entire notion is absurd! It must be remembered that measurements began during the tail-end of the 70’s cooling scare. During the 70’s cooling scare the good Dr. Lamb and his colleagues assured us that we were heading into an ice age. Now we are to believe that the steady increase in Antartic sea ice extent is caused by glacial melting? How then shall we explain the rapid recovery in the Arctic sea ice extent? Finally, why have Antarctic air temps declined over the period in question, despite increased levels of CO2 concentration? Of the two camps with opposing views, which is in denial? But not as warm as the MWP then? Shayn Roby’s Take: As Al Gore might be forced to put it: The South Pole is the INCONVENIENT POLE. Договорились с мастером из фирмы IceDoc.ru о ремонт холодильников на дому.Приехал быстро, очень толковый, сделал все за 40 минут. The WUWT Hot Sheet, August 5th 2013 | Watts Up With That? What the ‘year of living dangerously’ at nearly 400 ppm of CO2 in Earth’s atmosphere looks like | Watts Up With That?